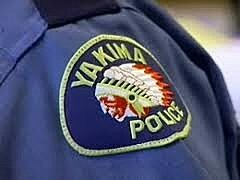 A 39 year old Yakima man with a long history of crime faces robbery charges this week after being arrested last Thursday for what police say was a violent robbery at a local mini mart..the Las Milpas at 6th Avenue and Nob Hill..authorities say David Vickers entered the store with a shotgun while the owner went into a bathroom to call police...when he walked out of the bathroom police say Vickers fired a shot and missed the owner who then tackled Vickers inside the store. the two struggled and Vickers took off...police say he tried to carjack several drivers in the area but police arrived and took him into custody. He faces multiple charges in county superior court.